Stories from around the wildlife film-making world! 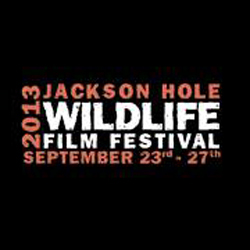 The Jackson Hole Wildlife Film Festival is delighted to announce the outstanding finalists selected for the 11th biennial 2013 Jackson Hole Wildlife Film Festival. This year’s entries included 540 films entering more than 900 categories to compete for 23 special awards. More than 100 international judges screened an aggregated 2500+ hours in order to select the finalist films. Finalists in the Sound Category, as well as programs that will move forward for “Special Consideration,” will be announced on August 12, 2013. The 2013 award winners will be selected by a distinguished panel of judges immediately preceding the five-day industry conference hosted at the Jackson Lake Lodge in Grand Teton National Park, September 23-27, and will be announced at the Grand Teton Awards Gala on Thursday, September 26th. Congratulations to the 2013 Finalists! One Breath - A Monterey Bay Experience Talbot Films Inc. Flight of the Butterflies SK Films Inc.
Wildlife-film.com congratulates all of the finalsists, especially those of our members that have made the list (in bold above!). Since the late 1990s Wildlife-film.com has been the leading source of information for the wildlife filmmaking industry worldwide. For over twelve years the site has been Google's number one ranking site for 'wildlife film' and related searches. Our site is viewed in over 175 countries. Our newsletter, Wildlife Film News, is read every month by thousands of people involved in wildlife filmmaking - from broadcasters and producers, to cameramen - we encourage readers to submit their news. We also serve as an online resource for industry professionals and services. Find producers, editors, presenters and more in our Freelancer section, and find out about festivals, training and conservation in Organisations. We encourage amateur and professional freelancers to join our network and welcome all wildlife-film related organisations to join our team. Disclaimer: Wildlife-film.com publishes information and opinions as a service to its' members and visitors/readers. The producer does not recommend or endorse any particular method, institution, product, treatment, or theory. Opinions expressed on Wildlife-film.com are not necessarily those of the producer.